True story. I had no plans of shopping during our Goodwill Thrift Up!. I was going to just move around, take pictures, mingle, and keep the time. However, the thrift spirit rose in me. Once I saw everyone filling their carts with finds, I couldn't help myself. I spent $75 between both of our stops. I bought 19 items including 5 skirts, 4 tops, 3 pairs of pants, 2 jackets, a pair of shorts, a dress, a romper, pajamas, and sandals! Never worn and still available online thong sandals. They were a smidge to small but I bought them anyway because I knew I could find a good match for them. Sold them the next morning on Instagram. The mandarin collar shirt had to be mine because cow print is the one animal print I do not own. The patterned skirt is everything I love. Midi length. Pockets. High Waist. I spotted the Kay Unger jacket while I was in dresses. One of the thriftanistas had it in her hands and was putting it back. I asked her if she was sure before adding it to my pile. It's a great fit and moves very well much like my kimono jacket. I had a bit of summer fever when I found linen shorts. They're perfect for the SAHM life. Loose fitting but tailored as one would expect from Anne Taylor. Spring cords from Loft in my size..in yellow..in petite length. In other words. Meant for me. The next two pairs are my style but not my size. I like them because they are elastic waist patterned pants. One tapered and the other more like culottes. I didn't try anything on I just bought what I could wear or sell. These will have to be sold. Girl sees sequins and loses her mind. The jacket is pretty awesome but the shoulder pads have to go. I'm not anti-shoulder pads at all but these are ridiculously large. My thrift buddy, Soul Outthrifters found the dress for me. She thought it was my style. She is right. Unfortunately it's not my size. My back is too fat. This dress has so much potential! Argh. First skirt is a stretch knit black Calvin Klein skirt found by Simone -- another thriftanista on the bus. This is why I always say thrift with your friends! 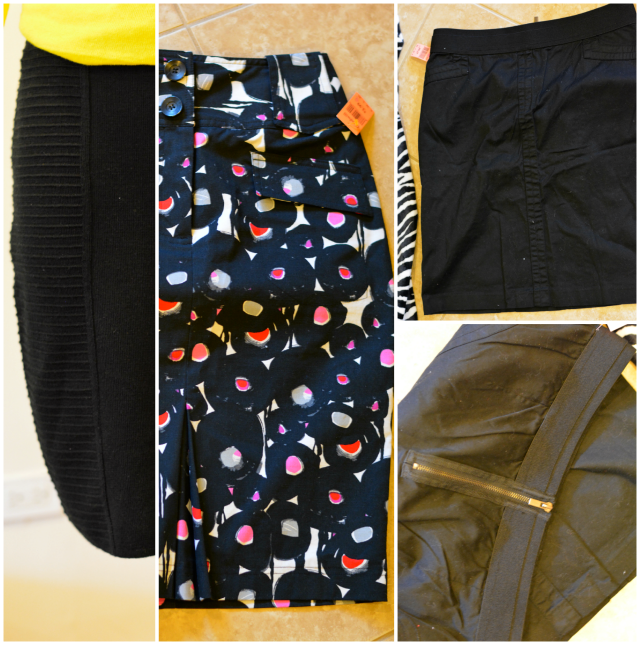 Second skirt is a patterned pencil with a faux front split and pockets! Not my size but I just thought it was too cute to leave behind. 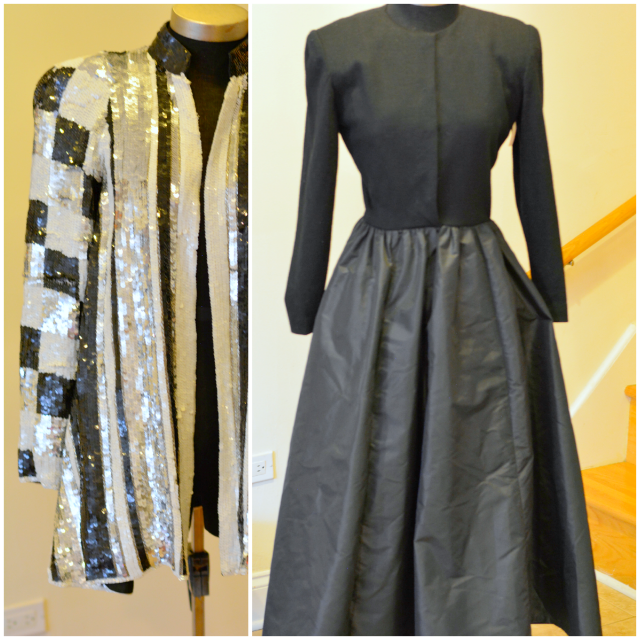 Third skirt is also a pencil skirt and one to sell. I really liked the exposed back zipper. 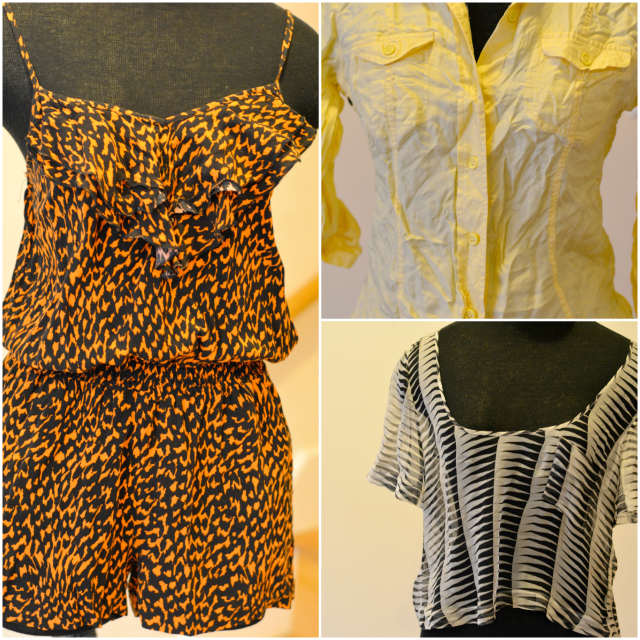 I found these items specifically for a subscriber - an orange / black romper, a yellow Gap camp shirt, and a designer Mike Gonzales silk chiffon top. 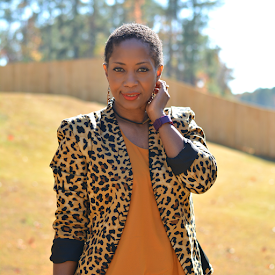 Free personal shopping for subscribers! 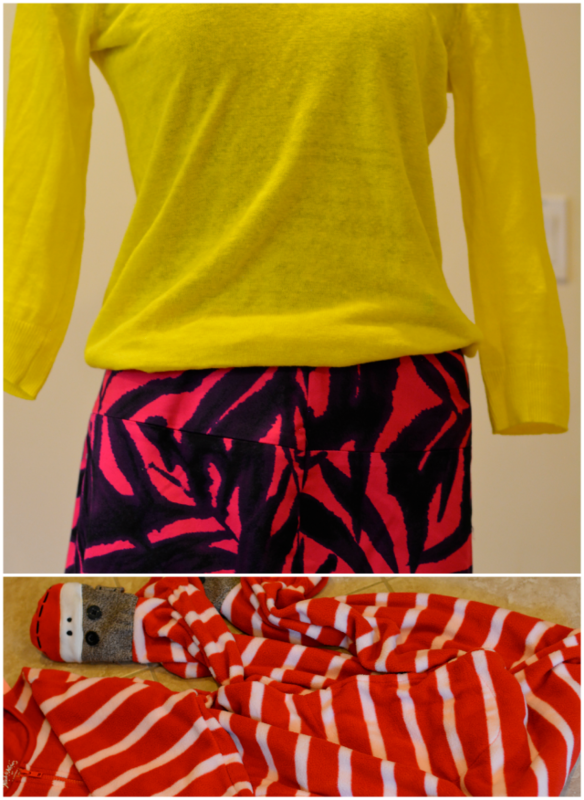 The yellow lightweight sweater is perfect for the weather here in Chicago. It's still cold but the color is so appropriate for the season. A fun mini skirt. It's so mini that I don't even know if I will wear it. 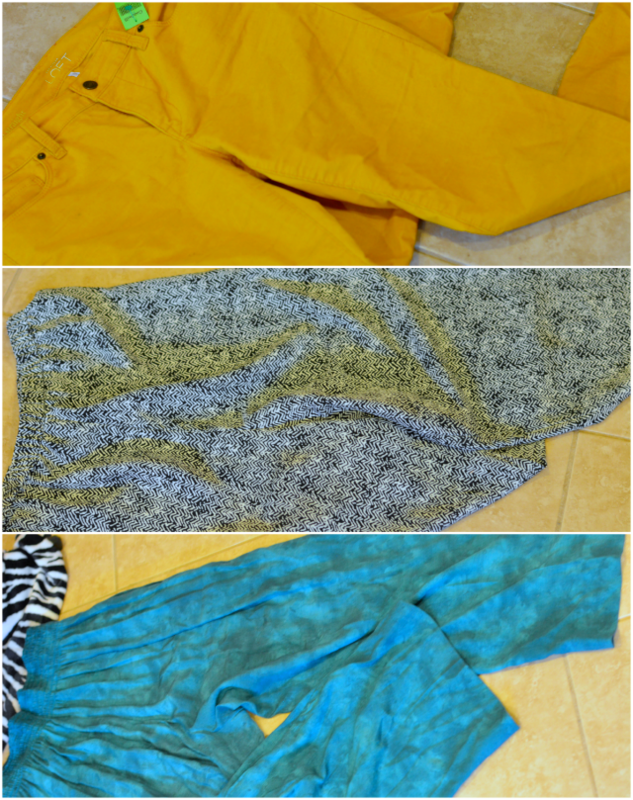 I was dazzled by the pattern and bright colors. New with tags Target footed pjs for adults! Yep. Needed those. When I showed them to E, he said to make sure I save those for Violet when she goes away to college and that she has them until around 30 years of age. File these under man repellent. Womp. Womp. They have a zipper. Wink. Wink. 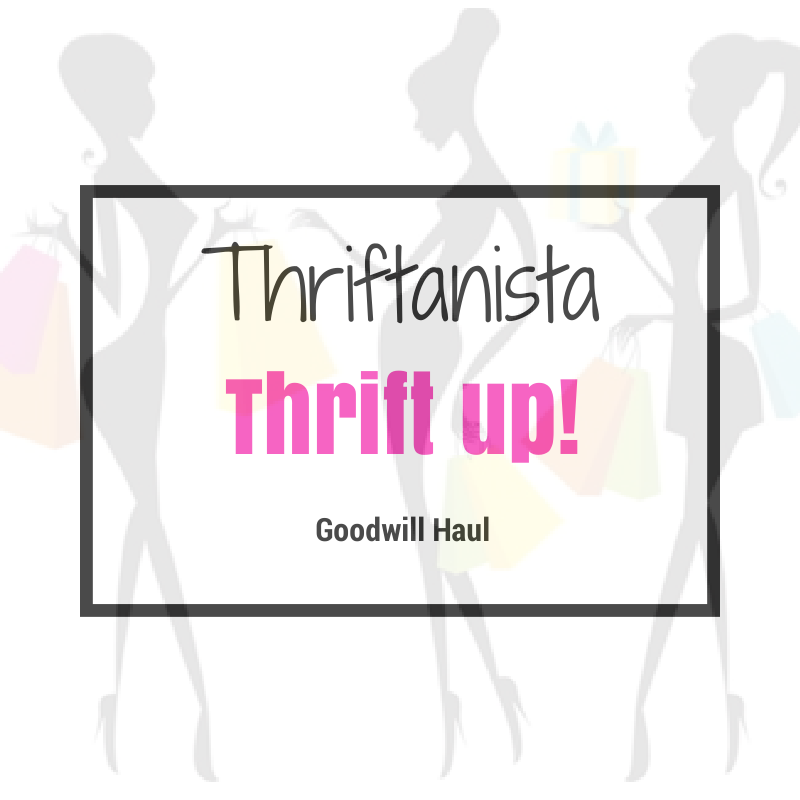 Have you thrifted Goodwill lately? Great stuff, and I'm not surprised! I LOVE that jacket... I hadn't seen that find! And love the way it looks with those shorts and that cute top. I got great stuff and I'm super happy with my small, but perfect-for-me haul :) I got the Alexander Wang dress, a floral babydoll style dress, a cute sleeveless top that says "yes, weekend", and something else that's escaping me at the moment. All in all a successful day! 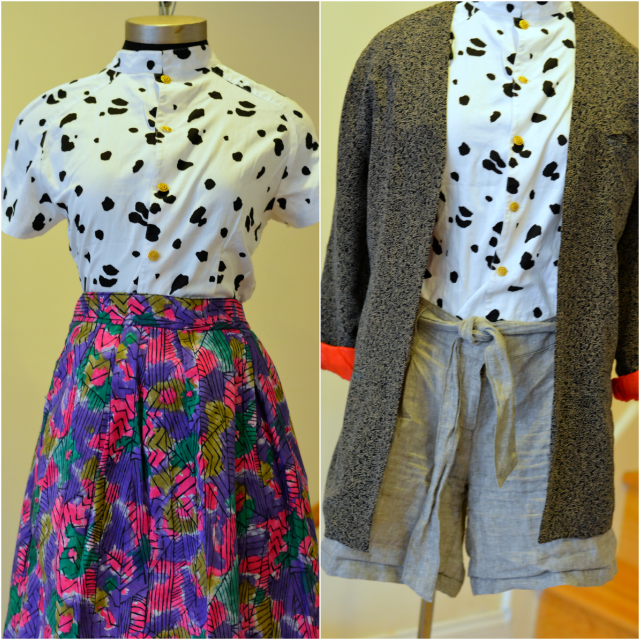 I am just loving all the prints and designs! YES! Hate that dress is too small for you because that is an amazing find. Seriously. Love those sandals and the romper. VERY nice finds! When I'm done moving, I'll have time to show off some of my finds too! I'm very anxious because I found some great things! Thriftanistas Rule! Brilliant Finds... I love all of them!